I had an individual Nordic walking session with Fiona and was impressed by the whole body work out that I experienced. As someone who runs and cycles, I was pleased to find a way to exercise my upper body while walking. It feels like a great way to strengthen my upper body while being outside. I hope it will help my endurance at swimming, too. I would recommend it as a cross training exercise for anyone who likes to get outside and get fitter. I was looking for something which would give me a bit more of a work-out than walking (or strolling if I am honest) and, as an ex runner, I wanted to feel as if I had really put some effort in. I also wanted to be out in the wonderful Peak District with the prospect of being with like-minded people. Nordic Walking ticks all the boxes. 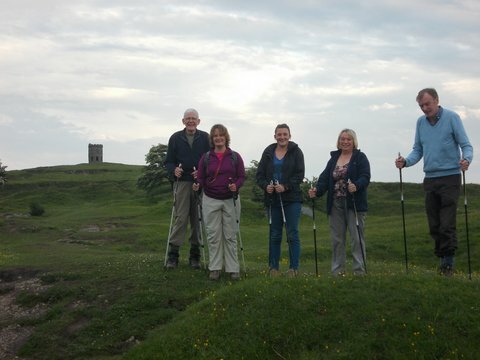 I would thoroughly recommend Nordic Walking – fresh air, good conversation and great exercise. I really enjoyed the taster session – you made it such fun, lovely meeting the others in the group. I haven’t learnt so much and laughed such a lot in ages. Often thought I would like to have a go at Nordic walking but thought I had two left feet (as I seem to have on the dance floor) so thought I would struggle. Some way to go I know to master it and get the most from it but you made it feel easy and I just did not realise the propulsion and sense of invigoration it could give. Think I will sign up for some of your varied walks and very reasonable pole hire and take it from there. Just back from hill walking with the dog and thinking how much easier I’d find these mountains with Nordic poles.